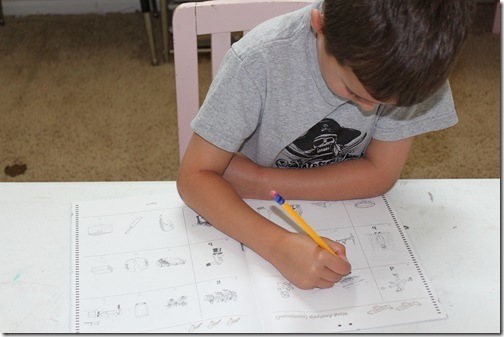 Homeschool Standardized Testing….to test or not to test? That is the question at hand today! This year I took the plunge and decided to test my kids. I wanted to do it as a trial year before we actually had to submit our results. I also thought it would be good practice for the kids to do a “standardized” test as well as for me to gauge how we were doing. In our state testing is required for odd years only starting at grade 3 so we will be officially needing to test at the end of this 2011-2012 school year. Homeschool testing requirements vary by state, so you’ll want to check recent laws by state, you can find information at the HSLDA Website. 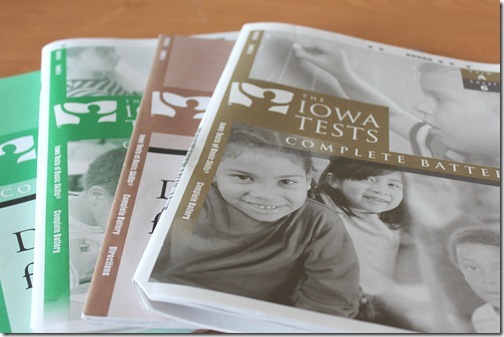 PLEASE NOTE: I do not live in IOWA, the Iowa Standardized tests are available no matter where you live, you can administer any test you like as long as it is acceptable through your state requirements. I was previously nervous about the whole “testing” topic and had kind of avoided it, but really it was very easy! I wanted to share a little info with you all to relieve any test anxiety you may have as well. STEP 1. Choose your tests. 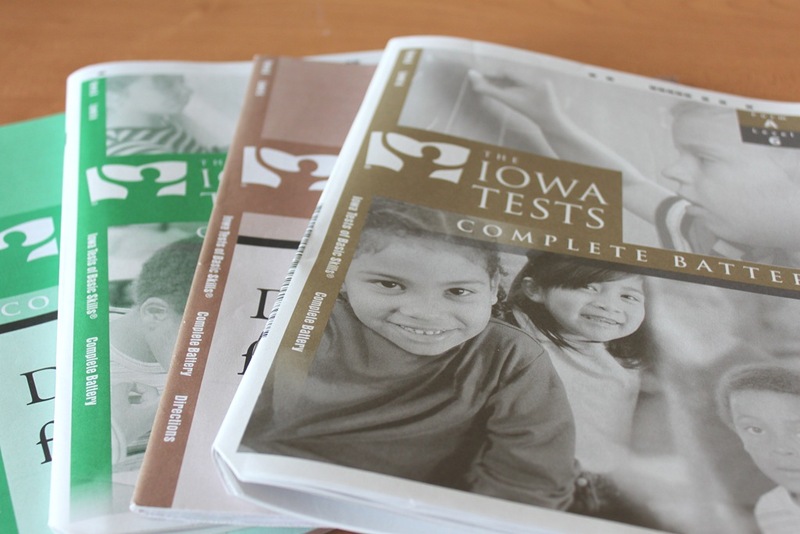 If you hold a Bachelor’s Degree you can order the Iowa Standard Tests from BJU Press Testing. You can also order Stanford Tests from them as well. You can find more information on Test options at HSLDA Website. If you are going to do Iowa’s you need to first get approved as a test administrator. There is a Test Administrator Application link on the left sidebar of their site. For Iowa’s you’ll need to send in a copy of your Bachelor’s diploma. I faxed it over and received approval within about 10 days. Tests must be completed and returned within a certain time frame, they will give you specifics when you order. If you don’t hold a BA you can still administer tests at home by using the CAT tests. You can purchase them from Christian Liberty Press. They are a bit shorter so they don’t take as long, and they are also a less expensive option as well! If you don’t wish to test your kiddos at home, you will need to find a certified testing administrator in your area. You can contact BJU Press for help finding registered test administrators. Also make sure to check with local homeschool organizations they often offer group testing and discounts, in addition many umbrella schools offer testing services even if you do are not registered with them. Option 2: Practice Tests: If you’re just wanting an evaluation for the year, or if you want to practice, you can order practice tests from BJU Press as well. They are less expensive and still give a good level of practice for teacher and student. Tip from the trenches: If you know you are going to test this year, be proactive and set a date to order tests so they arrive close to when you finish school for the year. I waited until July to test and kids tend to “forget things” once they go into summer brain mode. Next year I’ll make sure to order so we test right at the end and then we can relax for the summer. STEP 2. Administer Tests. I did these separately due to differing grade levels. You’ll want to pick a well lit spot, and provide a quiet time with little distraction, for us this meant during nap time. The other kids were directed to watch a movie and stay quiet until the testee was finished. We chose to do a few tests each day. If you follow the test schedule in your book you’ll see it can take up to a week to complete the tests if you do 2-3 per day. I found my kids did better when we did a couple per day as opposed to doing them all in one day, but you could certainly choose to do that. We had “Testing Week” at our house and at the end of the week, we took them out for ice cream to celebrate! Tip from the trenches: Have plenty of sharpened pencils and scratch paper available before starting. STEP 3. Send in your completed tests. You’ll want to follow all return directions for whatever tests you purchased. Flip through your test booklets and make sure there are no stray marks or incomplete dots filled in so as not to skew your results. Make sure all items to be included are sent back or your results will not be processed. Iowa’s will require you use a service such as FedEx or UPS so the package is trackable. STEP 4. File your results: If it is a required testing year for you, you’ll want to submit your test scores to the appropriate location. You will need to find out what is required in your state, in ours, I am required to submit my testing results on odd years starting at the end of grade 3 to my local school district, or I can also submit them to my umbrella school. In some cases if you are enrolled in a public school funded options program (a.k.a. “Friday School” and the like) you are required to keep records of testing yourself. Either way, you’ll need to find the appropriate method of submitting results for your state and follow those rules. For more information on testing options and your state laws visit www.hslda.org. Now that we’ve completed our first year of testing, I want to assure you that it is not as difficult as you may think it is. The tests are fairly easy to order, administer, and submit. Our kids did very well on them and it was a nice re-assurance to me that we are doing well in our decision to homeschool. I do have a few areas to work on, and that is a good thing to find out as well. Please note: This post is not to be considered as legal advice. You will need to check www.hslda.org for testing requirements in your state. Good article and very helpful to those who do not have state testing automatically through their homeschooling affiliate. Our homeschooling is done through a public charter school, hence since the public pays for it with state monies, we have no choice but to do the state testing. With that said, I think it really is a good indicator for the parent as to how their child is doing in different subjects that other children around the state and nation, eventually their college peers, are learning. It helps me see what I, the teacher, need to focus on for my child the next school year and make sure that I’m not overlooking any particular area. It is a good gauge for me. Thank you! This has been on mind as we are required to test every 3 years starting in the 3rd grade. I have made my own tests years just as practice and this year I plan to do standard practice tests in a testing environment. We live in Qc, where they are actively harrassing homeschoolers. This year I decided to test so that we had documented proof of progress in case we come under fire! I was very pleased with Seton’s testing service and we had the results back in less than a week. I have to say that it was also really nice to see what I felt were “problem areas” confirmed by the test, and to show M that she is actually a lot better at math than she’s giving herself credit for! Thank you for this post! I am new to homeschooling (this school year) and have much to learn! I cannot remember how I came across your blog, but I sure am enjoying it! Thanks again and blessings to you! We live in a state that is very home school friendly and does not require testing. We decided to require testing of our kids for a few reasons: should they decided to go to college, we want them to be expert test takers. That expertise will come with practice. :o) We wanted confirmation of where they stand as compared to their public schooled peers…not just for our own peace of mind but also for family members. Our state home school organization compiles all the testing data from home schoolers into a report and presents it to our state legislature. Seeing how much better a large population of home schooled kids do in comparison to public schooled kids really helps to ensure that our legislatures remain home school friendly. Thank you so much! I had no idea how to do this! I appreciate your time in posting this for everyone! Our homeschool group requires all students to be testing grades K-12 using the Scholastic Achievement Test. (SAT) My kids love testing week. They make it a lot of fun. We have a used book sale at the sight, picture day and lots of homemade goodies for snacks. The kids enjoy bringing their lunches and seeing their friends. (We test at the local Christian School when they are Easter break.) I also enjoy seeing the kids scores to know where there are excelling and what we need to work on the next year. It’s all about our attitudes. Great article Erica!! We tested for the first time this May! We chose to do Stanford, may try Iowa this school year!